Online learning platform Course Hero is turning great works of literature into the visual representation of text and data known as the infographic. The new "Literature Infographics" are "a unique way for students to learn about the characters, themes, authors and literary devices contained in the works many students will be reading this year," according to the company. The series currently offers more than 90 titles, including Alice in Wonderland by Lewis Carroll, Macbeth by William Shakespeare, Pride and Prejudice by Jane Austen, The Great Gatsby by F. Scott Fitzgerald and To Kill a Mockingbird by Harper Lee. 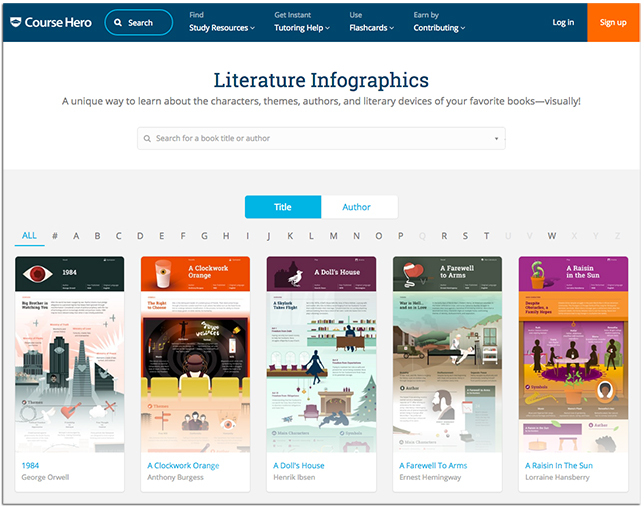 "We believe our Literature Infographics will help students better understand the complex ideas behind some of these great works of literature by providing a visual, story-driven perspective to the content they are related to," said Course Hero Co-Founder and CEO Andrew Grauer, in a statement. "It's also our hope that educators will find these materials rich, engaging and helpful in addition to the lectures, class notes and other materials that they painstakingly prepare for students in the classroom." The Literature Infographics are available for free on the Course Hero site.